Like most companies Dr.Roof had humble beginnings. Paul Mazurik started roofing in Winnipeg, Manitoba in 1983 as a helper on a crew. After several years of training and hard work Paul became one of the top installers in Winnipeg. In 1986 he began operating as Paul Mazurik Roofing. His commitment to quality was always first and foremost and it’s this commitment to quality that allowed him to grow. Over the next ten years Paul trained several roofers in the Winnipeg area and slowly expanded into two crews. In 1996 he decided to change the company name to Dr.Roof. 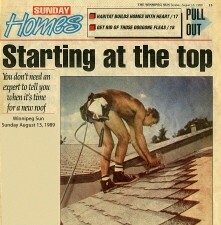 In 1998 Dr.Roof was growing and getting too busy for Paul to handle every aspect of the roofing business. Wanting to maintain the quality and reputation he worked so hard to achieve, he decided to take on a partner. This is when Norm Gregoire entered into the picture. In 1999 Paul and Norm officially joined forces and formed what is the current version of Dr.Roof. Norm has been in the roofing, eavestrough, soffit, fascia and siding business since 1989 and has been involved in the Winnipeg construction industry since 1976. Norm and Paul had a working relationship long before becoming partners. They both had the same focus on quality and customer service which made them a perfect fit for one another. Knowing each other and having worked with one another for several years made the transition from a one man show to a partnership much easier. This newly formed partnership allowed Dr.Roof to grow while still maintaining its high standards. Dr.Roof now operates with a fleet of 10 trucks and vans and 6 dump and equipment trailers. We are equipped to handle any shingle roofing job, no matter how large or small. Our goal today is the same as it was back in 1986; to provide our customers with a quality job at a reasonable price. Dr.Roof is unique in the industry as our installers are hourly employees as opposed to piece work sub contractors. This allows us to have more control over the quality and consistency of the work performed. The end result means that you the customer get a quality job. Dr.Roof has grown but has still maintained that small company feel. Paul and Norm are involved in all aspects of the day to day operations of the company and are still involved in every job ensuring that you are getting good advice from people who are dedicated to the roofing and exterior renovation industry. Give them a call at 204-453-5553 and see the difference for yourself.